Happy Birthday To The Bionic Woman – Wait, I Know This! 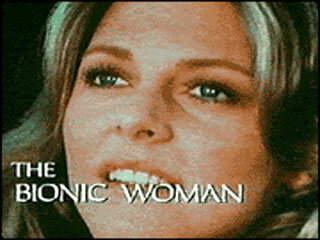 On this date in 1976 The Bionic Woman premiered on ABC. According to Wikipedia the show aired for three seasons between 1976 and 1978 as a spin-off from The Six Million Dollar Man. Wagner stars as tennis pro Jaime Sommers who is nearly killed in a skydiving accident. Sommers’ life is saved by Oscar Goldman (Richard Anderson) and Dr. Rudy Wells (Martin E. Brooks), by bionic surgical implants similar to those of The Six Million Dollar Man Steve Austin. As the result of Jaime’s bionics, she has amplified hearing in her right ear, a greatly strengthened right arm, and stronger and enhanced legs which enable her to run at speeds exceeding 60 miles per hour. The series proved highly popular worldwide, gaining high ratings in the US and particularly so in the UK (where it became the only Science fiction program to achieve the No.1 position in the ratings during the 20th Century). The series ran for three seasons from 1976 to 1978 and was first shown on the ABC network and then the NBC network for its final season. Years after its cancelation, three spin-off TV movies were produced between 1987 and 1994. Reruns of the show aired on Sci-Fi Channel from 1997 to 2001. A remake of the series was produced in 2007.